The idea that Alzheimer’s is contagious is likely far-fetched to anyone familiar with the condition. While there is no risk of the disease spreading from person to person, new findings suggest an unusual way the “seeds” of Alzheimer’s may have been transmitted in at least one case—through growth hormone treatments. The finding has its roots in prion diseases. A prion disease, like Creutzfeldt-Jakob disease (CJD) or mad cow, is caused by misfolded or “tangled” proteins in the brain that lead to a number of degenerative effects. Alzheimer’s is believed to have similar roots, with the disease’s plaques on the brain being made of misfolded amyloid peptides. In animal studies, this theory was corroborated by lab animals developing amyloid plaques after being injected with human brain tissue from Alzheimer’s patients. All of this connects to human growth hormones (hGH) that were used to treat growth deficiencies in children. Today, all hGH treatment hormones are made in labs. Between 1958 and 1985, however, they were harvested from the pituitaries of cadavers. The practice was stopped when some 226 CJD infections were traced to hGH treatments. Researchers studying CJD looked at the brains of eight individuals who contracted the disease from contaminated hGH treatments. They found that all but one showed amyloid plaques in the brain tissue, with four having significant Alzheimer’s pathology. All of the subjects had died before Alzheimer’s symptoms could show, but the researchers believe they would have developed dementia had CJD not claimed their lives. Due to the rarity of this form of amyloid plaque in people so young—all of the subjects were between the ages of 36 and 51—it is theorized that the hGH treatments may have also delivered amyloid seeds that infiltrated the pituitary from other parts of the harvested brains. 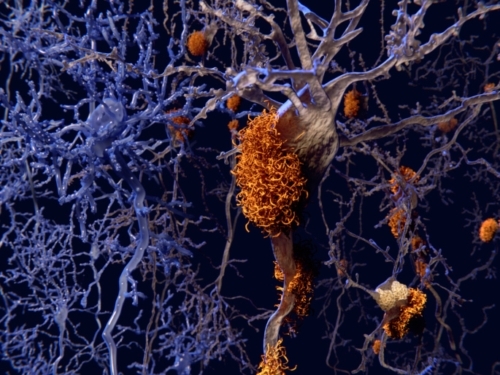 The concern raised by this study is the possibility that the amyloid prions of Alzheimer’s could be transmitted in a manner similar to CJD. Prions are very hard to kill and decontaminations powerful enough to deactivate them can also damage certain medical instruments. This, combined with the rarity of CJD, is why neurosurgeons normally only perform standard sterilizations. Alzheimer’s, however, is much more common than CJD. If the transmission potential is confirmed, it could dramatically change how sterilization is performed in surgical practices. The researchers stress that their findings only pertain to possible Alzheimer’s transmissions relating to contaminated hGH practices that were discontinued decades ago. The link still needs to be confirmed, and confirmation studies are already being planned. Further investigation would be required to determine if amyloid prions could be transmitted through means other than injections harvested from the brains of cadavers. Abbott, A., “Autopsies Reveal Signs of Alzheimer’s in Growth-therapy Patients,” Nature 2015; 525(7568): 165–66, doi:10.1038/525165a. Deng, B., “Alzheimer’s Research Takes a Leaf from the Prion Notebook,” Nature 2015; http://www.nature.com/news/alzheimer-s-research-takes-a-leaf-from-the-prion-notebook-1.17654. Eisele, Y., et al., “Peripherally Applied Abeta-containing Inoculates Induce Cerebral Beta-amyloidosis,” Yearbook of Medicine 2010; 330(6006): 980–82, doi:10.1126/science.1194516. Jucker, M. and Walker, L., “Neurodegeneration: Amyloid-β Pathology Induced in Humans,” Nature 2015; 525(7568): 193–94, doi:10.1038/525193a.